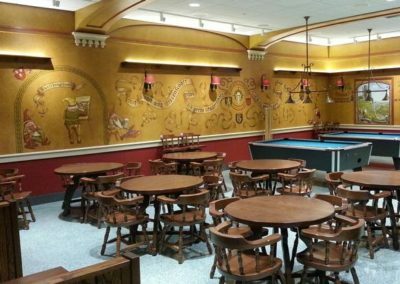 For more than 100 years, the Rathskeller and Stiftskeller have been the primary social hubs of UW Madison’s Memorial Union. Modeled after traditional German drinking establishments, they are decorated with high arches, dark wood, and whimsical murals depicting characters and witticisms from German folklore. These lively murals were hand-painted by artist Kurt Schaldach in 1978, and depict fun, friendship, drinking, and merrymaking. In 2012, plans to renovate the Stiftskeller threatened these one-of-a-kind murals. In order to preserve the unique character of the space, Conrad Schmitt Studios developed a plan to replicate the historic artwork. Before demolition, CSS artists photo-documented the original artwork and traced the murals to exact scale for future replication. Lead artist and UW alum Dave Andrews said, “Because of my familiarity with these murals and this building, I had added motivation to do them justice. It was my intent for Conrad Schmitt Studios to match the free flowing and expressive style, stroke by stroke, and execute perfectly replicated characters.” The room was reconstructed and new wall surfaces restored. New base paint and a decorative glaze were applied to match the surrounding rooms and surfaces. Tracings of the original murals were transferred to the walls using white graphite paper. After studying the high-resolution photgraphs and preparing color samples, the painting of the murals began. To maintain a consistent style from one mural to the next, one artist painted all the figures and props, while another reproduced the hand-lettered German sayings. A clear varnish was applied over the walls to protect the murals and allow for easy clean-up in this bustling, social environment. In addition to the replications, four murals on canvas were saved during construction and were conserved by Conrad Schmitt artisans working with UW Madison’s painting staff. Conrad Schmitt Studios rebuilt and replicated the murals, preserving the historic character of this unique cultural treasure. Conrad Schmitt Studios rebuilt and replicated the murals, preserving the historic character of this unique cultural treasure.